It was just what Sir Jack ordered. A party, not a wake, with champagne (prosecco) and orange, tea and coffee, sandwiches and cake. A time to remember this remarkable character who died just eight months short of his 100th birthday, after a colourful life of 36,305 days. He passed away in April aged 99 a few months after he had received France’s highest honour, the Légion d’honneur, for his part in the defence of that country in the Second World War. Four generations of the Leslie family were around him when he passed away peacefully. The magnolia trees were in bloom as the horse-drawn hearse carrying his remains made its way along the driveway at Castle Leslie to his final resting place outside the walls of St Salvator’s church, where Catholic members of the Leslie family are buried. At Monaghan Museum video footage of the funeral was shown. Mark and Antonia Leslie helped to carry the remains. Tarka King read a message of sympathy from the Brigade of Guards. On Monday night the family members gathered again for what Curator Liam Bradley said was an evening of remembrance and celebration. He described Sir Jack as a very wonderful man and said he had got to know him well in the last few years. Tuesday 6th December would have been Sir Jack’s 100th birthday. Before he died he had asked for an evening to remember him in a cheerful way and definitely not a sombre mood. His was a life well lived. Liam Bradley then introduced Sir Jack’s niece and two nephews to share their memories of the fourth Baronet of Glaslough and Pettigo. They were followed by former Eurovision Eimear Quinn from Carrickmacross, who sang a medley of songs chosen from different times of the past one hundred years marking different events in Jack’s life. Tarka Leslie King said his uncle Jack was an example of bravery. From his mother (Anita) he learned that Jack had a really bad start in life when at the age of three he developed an ear mastoid that meant he sometimes screamed with the pain. Anita and Jack became very close. He was younger than her. Eimear Quinn’s Medley consisted of eight songs that reflected different periods in Jack’s life. A beautiful note on which to finish the evening. the beautiful night, and the laughter. John Norman Ide Leslie, always known as Jack, was born on December 6th 1916 in New York where his father Shane, a writer, diplomat, convert to Rome, and supporter of John Redmond’s moderate nationalist party had gone to counter Irish-Americans trying to keep the United States out of the war. Jack’s mother, born Marjorie Ide, was a well-connected American whose father had been governor general of the Philippines. Young Jack caught the Spanish Flu in the epidemic of 1918 and was given up for dead when his temperature reached 106. His father, he recalled, asked the nuns next door to pray for him; that night his mother woke with a start to find his temperature had returned to normal. Soon afterwards, however, he developed a mastoid that left him deaf in his left ear. Jack was almost three when in 1919 he and his elder sister Anita were brought back by their parents to Castle Leslie, to be received by his grandfather, Sir John Leslie, 2nd Bt, and his American wife Leonie, whose sister Jennie was the mother of Winston Churchill. The Leslies had lost their eldest son Norman in the Great War, making Jack the ultimate heir apparent to the title and the vast estates that went with it. But his parents were based in London and, apart from blissful holidays in Ireland, it was there that Jack was brought up. “My world was populated by lords and ladies,” he recalled, “and naturally I believed that they were the people who ruled England and the enormous British Empire. Although our cousin Winston Churchill was Chancellor of the Exchequer, I thought the House of Commons was a purely advisory committee.” By this time (aged 15) he was at school at Downside. At Magdalene College, Cambridge, he rowed in the college VIII and joined the officer training corps. On graduation in 1938 he was commissioned in the Irish Guards and enjoyed a short period as a “Deb’s delight” before war intervened. Ordered to cross to Boulogne after the German invasion of Holland in May 1940, Leslie’s platoon were rendered helpless when their bullets bounced off the advancing German tanks. They surrendered and were marched across Germany to a prisoner of war camp in Bavaria, Leslie spent the rest of the war in captivity. On release, he returned to civilian life. 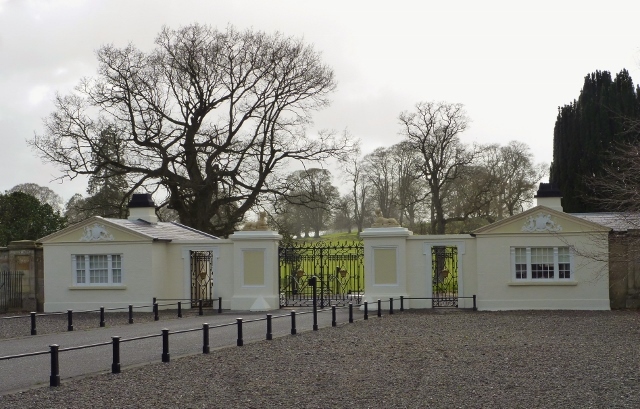 His grandparents had died and he found himself the major shareholder in the company that owned Castle Leslie. Having planted thousands of trees on the demesne, he embarked on a peripatetic life in Britain, continental Europe and the United States. In 1953 Leslie settled in Rome in a 16th century house he had restored in Trastevere. As a connoisseur of art, Leslie found much to enjoy in Rome, and as a devout Catholic he relished its religious life and was a pillar of the Order of Malta. He restored an ancient monastery and was rewarded with a papal knighthood. He returned in 1994 to live in Castle Leslie, which was by then being run by his niece Sammy. In 2001 he celebrated his 85th birthday by travelling to Ibiza to party at Privilege, then the world’s biggest nightclub. In 2006 at the age of 90 Leslie drew on his great memory to write his autobiography, ‘Never a Dull Moment’. In November last year he was among Irish veterans of the Second World War whom the French government appointed to the Légion d’ honneur at a ceremony at the French embassy in Dublin. Sorry to learn this morning of the death of Sir John (Jack) Leslie eight months before his 100th birthday. He was single. His age did not stop him from dancing his way around various nightclubs in Ibiza and Monaghan! The news was conveyed by the family on social media @Castle_Leslie, adding that he died peacefully at his home. In November last year (then aged 98) at the residence of the French Ambassador in Dublin, family and friends of Sir Jack joined the celebrations as the World War II veteran was awarded France’s highest distinction. The former Irish Guards officer was made a Chevalier de la Légion d’honneur, adding to his formal title of fourth baronet. The distinction was bestowed by the French Minister of State for Veterans and Remembrance, M. Jean-Marc Todeschini. Representatives of the British Army and the Irish Defence Forces were present for this important occasion that was another chapter in the historical friendship between Ireland and France. The Bishop of Clogher Dr Liam Mac Daid and Donagh Parish Priest Fr Hubert Martin were also among the guests. Sir Jack said he wished to accept the award on behalf of all soldiers from the island of Ireland who fought and died in the two great wars. As a second Lieutenant in the Irish Guards, Jack Leslie commanded a unit at Boulogne-sur-Mer in 1940 that took on the advancing Panzers of the German army and held them back for several days allowing thousands of other British soldiers to be evacuated from Dunkerque. He was taken prisoner and spent the rest of the war in a prisoner-of-war camp in Germany. Born on 6th December 1916 he was the eldest son of Sir Shane Leslie, 3rd Bt, and Marjorie Ide. He became the fourth baronet when his father died in 1971. He was educated at Downside School and Magdalene College, Cambridge. During World War II, he served as an officer in the Irish Guards during the Battle of France before being captured at Boulogne-sur-Mer. He then spent five years in POW camps. After the war he moved to New York and later travelled around Europe, settling in Rome. At the age of 78 he returned to his family’s homestead and traveled to Ibiza for his 85th birthday in 2001. He revealed the wedding location of Sir Paul McCartney and Heather Mills by admitting to reporters it was to take place in Castle Leslie, but that it was “a secret”. In January 2012 he appeared in the TV special “Secrets of the Manor House”, which discussed the Leslie family and Castle Leslie, among other manor homes. In 2015 he featured in the TV series “Tales of Irish Castles”. He was presented with the Legion d’Honneur at the French embassy in Dublin on 9 November 2015. Jack Leslie survived his older sister, the author Anita Leslie (Anita King d.1985) and his younger brother, Desmond Leslie (d.2001). In the immediate line of succession for the baronetcy are nephew Shaun and nephew Mark. His father was a first cousin of the former British Prime Minister Sir Winston Churchill. His paternal grandmother, Leonie Jerome, and Churchill’s mother, Lady Randolph Churchill (born Jennie Jerome), were sisters – the daughters of American financier Leonard Jerome. His mother, Marjorie Ide, was the daughter of Henry Clay Ide, a former Governor-General of the Philippines. Among the family stories examined in a current World War One exhibition at the National Library in Dublin was that of the Leslies of Castle Leslie, Glaslough, County Monaghan. Sir John was a veteran of the Second World War and was there to help with the opening of the exhibition. 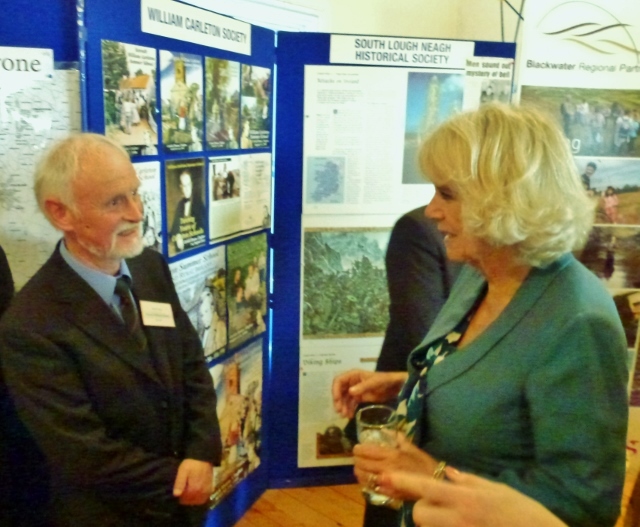 It was attended by the British Ambassador Dominick Chilcott and the Minister for Arts, Heritage and the Gaeltacht Heather Humphreys TD, from County Monaghan. 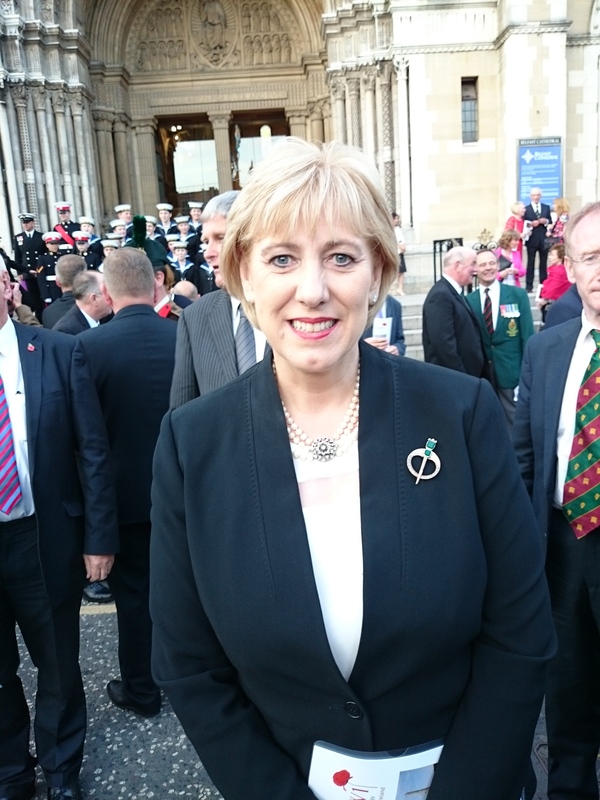 I reported in 2014 how the display will run for four years and features letters, diaries, newspapers, leaflets and photographs from the library’s archives and aims to depict the various aspects of the Irish experience of the war, and Ireland’s response to the conflict. It is supported by the British Embassy and is part of the National Library’s programme for the Decade of Commemorations. **Captain Norman Leslie, 28 Rifle Brigade, second son of the well-known Leslie family from Castle Leslie, had become heir to the family estate when his elder brother, Shane, converted to Catholicism and became a supporter of Irish Home Rule. An experienced soldier when the war broke out, Norman was shot and killed in October 1914, while charging a German machine gun armed only with a sword (it was considered ungentlemanly for officers to carry guns). He is buried in France at Chapelle d’Armentieres Old Military Cemetery. The sword he was carrying when he died was eventually returned to the Leslie family, and now hangs in the gallery of Castle Leslie. It was carried by Jack, his nephew, for the opening of the exhibition. Jack’s nephew, Mark Leslie; and Mark’s son, Luke were also present at the launch of the exhibition. 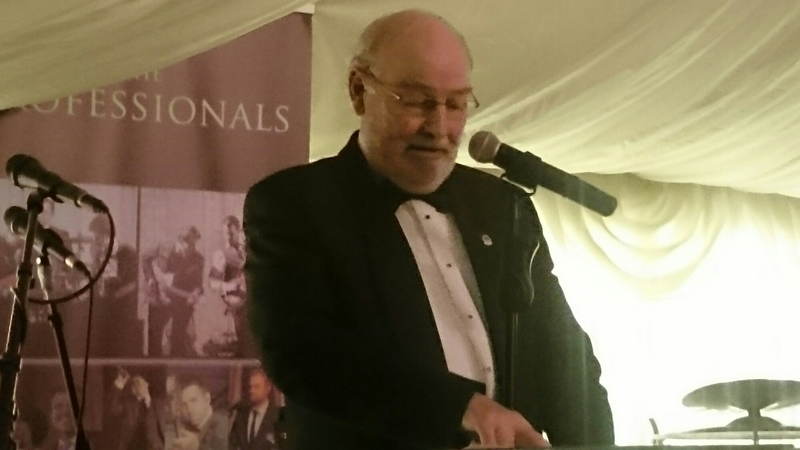 The family spoke of how Norman’s memory is kept alive at Castle Leslie, where his sporting trophies adorn the entrance hall and his sword – considered a symbol of good luck – is used to cut all wedding cakes at the Castle. More details of the exhibition can be found here. LIONS CLUBS IRELAND district 105-I Vice District Governor Paul Allen from Newbridge addresses the large crowd of over 200. 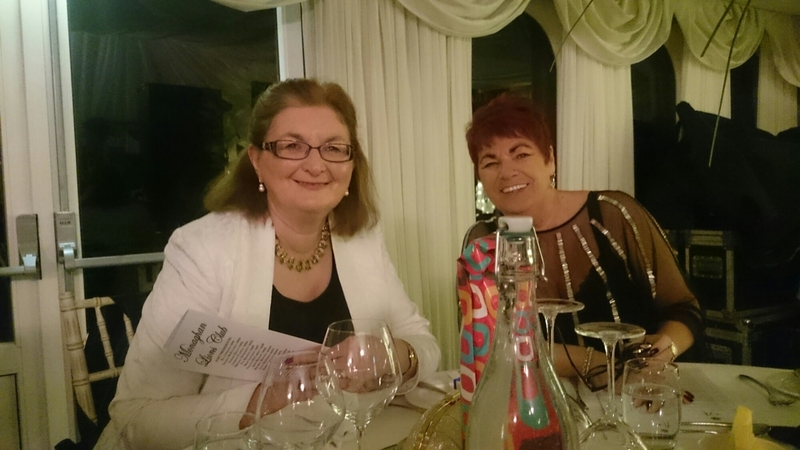 A great night was had by all members of Monaghan Lions Club and their guests at Castle Leslie, Glaslough, at the annual charter dinner, the 24th. The auction raised over €36,000 for club charities. 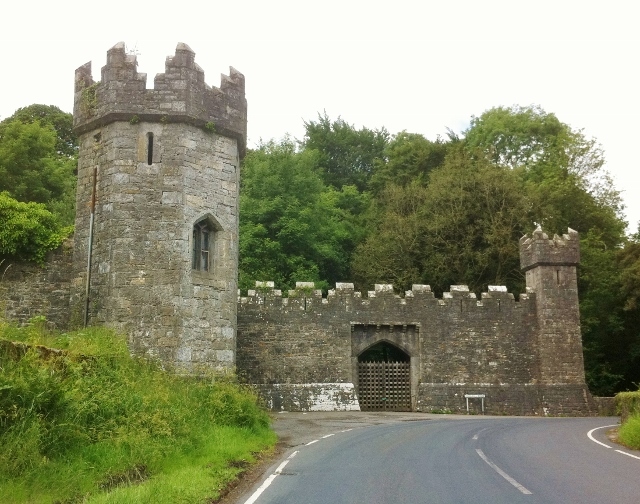 Among the family stories examined in a new World War One exhibition at the National Library in Dublin is that of the Leslies of Castle Leslie, Glaslough, County Monaghan. 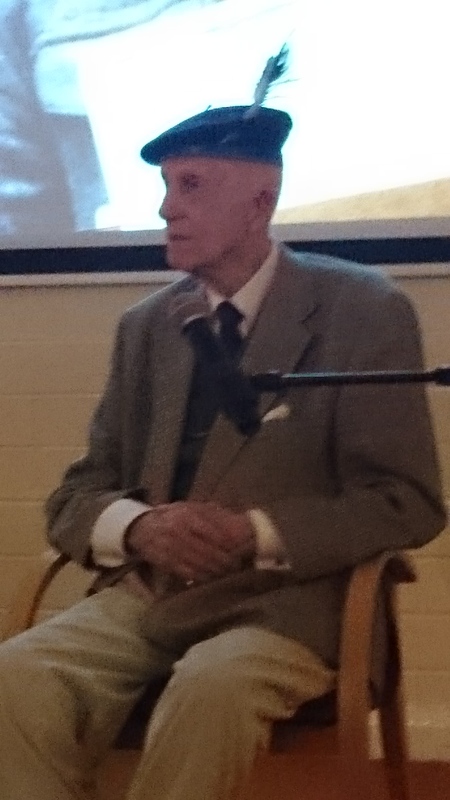 Sir John (Jack) Leslie now 98 and a veteran of the Second World War was there to help with the opening of the exhibition. It was attended by the British Ambassador Dominick Chilcott and the Minister for Arts, Heritage and the Gaeltacht Heather Humphreys TD, from County Monaghan. The display will run for four years and features letters, diaries, newspapers, leaflets and photographs from the library’s archives and aims to depict the various aspects of the Irish experience of the war, and Ireland’s response to the conflict. It is supported by the British Embassy and is part of the National Library’s programme for the Decade of Commemorations. Jack’s nephew, Mark Leslie; and Mark’s son, Luke were also present. 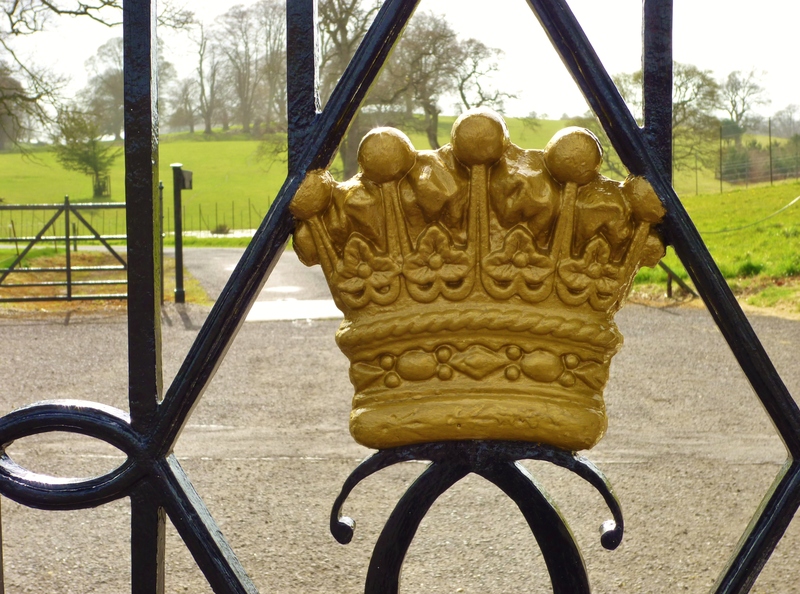 The family spoke of how Norman’s memory is kept alive at Castle Leslie, where his sporting trophies adorn the entrance hall and his sword – considered a symbol of good luck – is used to cut all wedding cakes at the Castle. **Joseph Mary Plunkett, the poet, journalist and revolutionary, best known as a leader of the 1916 Rising and a signatory of the Proclamation of the Irish Republic. In April 1915, he accompanied Roger Casement to Germany to seek German support for an uprising in Ireland. He subsequently fought alongside Pearse and Connolly in the GPO in 1916. Imprisoned in Kilmainham Gaol, he married Grace Gifford just hours before his execution in May 1916. **Mary Martin, a widow and mother of 12 from Monkstown, Co. Dublin. Three of her children served overseas during the war, including her son, Charlie, who was reported wounded and missing in late 1915. Believing he had been taken prisoner, Mary began keeping a diary in the form of a letter to Charlie. She subsequently discovered he had died of his wounds soon after his capture. Her other children, including her daughter Marie, survived the war. Marie, who had served as a nurse in Malta and France, went on to found the Medical Missionaries of Mary in 1937. Mary’s wartime diary is included in the NLI exhibition. **Michael O’Leary, a farmer’s son from Co. Cork, who served with the Irish Guards on the Western Front. In February 1915, he single-handedly charged two German barricades in France, killing eight men and taking two prisoner. He was awarded the Victoria Cross, and became internationally famous, with journalists even thronging to the O’Leary family farm in Cork. The story of his wartime exploits was put to very different uses, inspiring both a recruiting campaign and a satirical play by George Bernard Shaw. He retired from the army in 1921, but re-joined during World War Two. He died in 1961. The NLI exhibition includes an audio module, ‘Words and Music: the Sounds of War’, supported by the British Embassy in Ireland. This features Irish poetry of World War I, interspersed with popular songs of the period and recorded readings of original letters from those affected by the conflict. 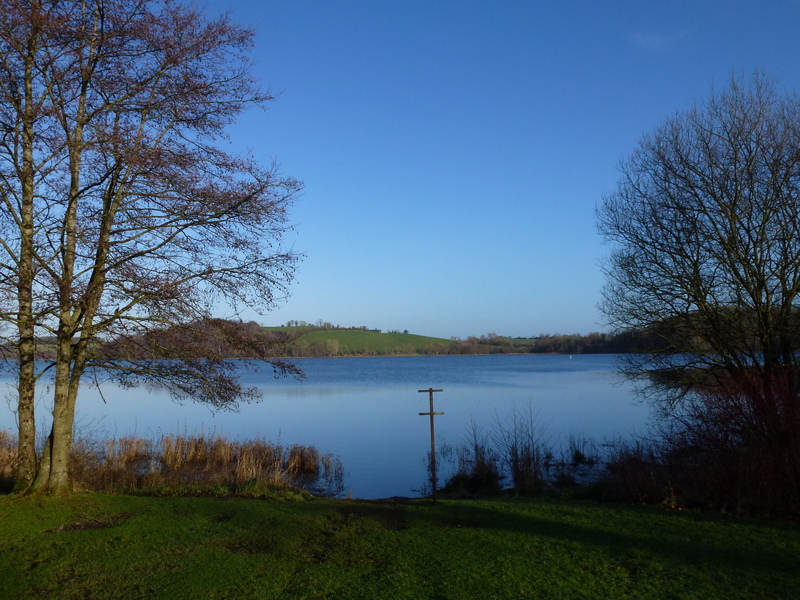 A visit to Emy Lake near Emyvale in County Monaghan a year ago provided me with one of the first stories for my daily blog, which I began on January 1st 2013, as well as providing a beautiful photo for the cover page. 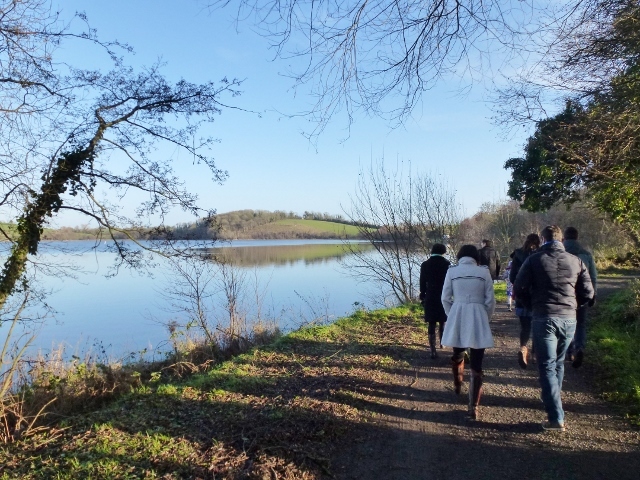 A nice 4km walk has been developed alongside the lake and the path has been improved so that it is accessible for buggies. Great work done by a dedicated committee of volunteers. 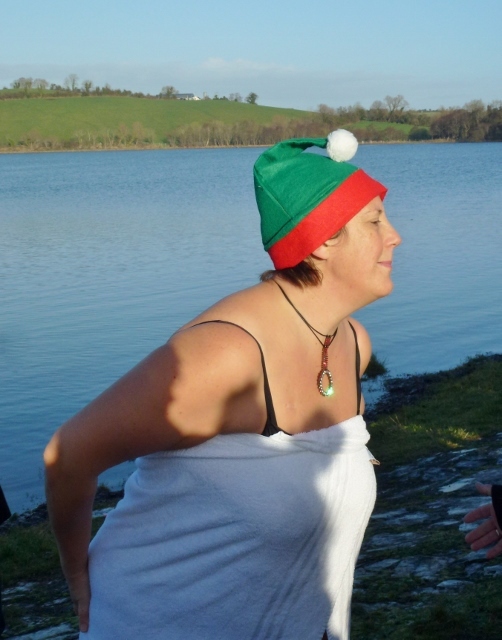 This is what I wrote last year: EMY LOUGH SWIM: Congratulations to all who took part in the annual Emy Lough Christmas dip for charity near Emyvale in County Monaghan. Organised by the friends and parents of people with intellectual disability. I spotted Paul Bowe father of the rugby international Tommy who is recovering from injury and also Sammy Leslie from Castle Leslie in nearby Glaslough among the participants. My car temperature said 8C but I’m sure the water was considerably colder, even though the sun shone and it was the mildest such day for the dip in many years. After the wind and snow yesterday morning on Christmas Eve (Tuesday), the weather in 2013 was almost better than last year with a good deal of sunshine. 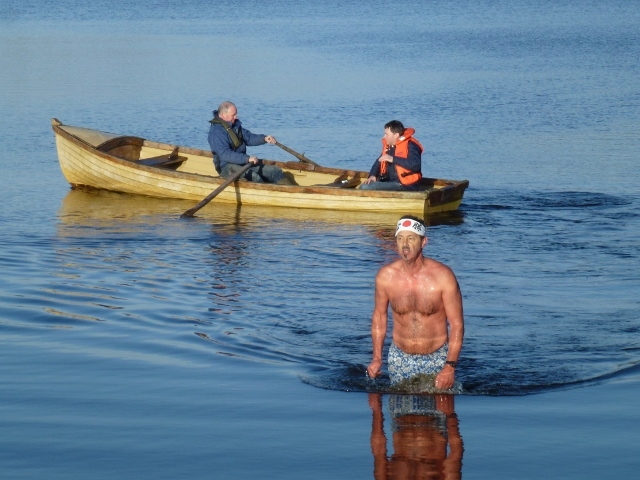 This time Tommy Bowe was able to take a dip along with his younger brother David and sister Hannah and their father Paul. Sammy Leslie from nearby Castle Leslie in Glaslough was back again wearing a red Santa top! Mark Leslie was also there, easy to spot with a Japanese bandana. He was one of two hardy swimmers who swam out as far as a small island in the lake and returned safely to shore, with two volunteers on standby in a rowing boat in case anyone got into difficulty. The Leslie family have been good supporters of this event which began 41 years ago under the stewardship of scout leader the late Benny McKenna and subsequently the late Garda Sergeant Dan Rogan. Similarly the Bowe family from Inishdevlin. 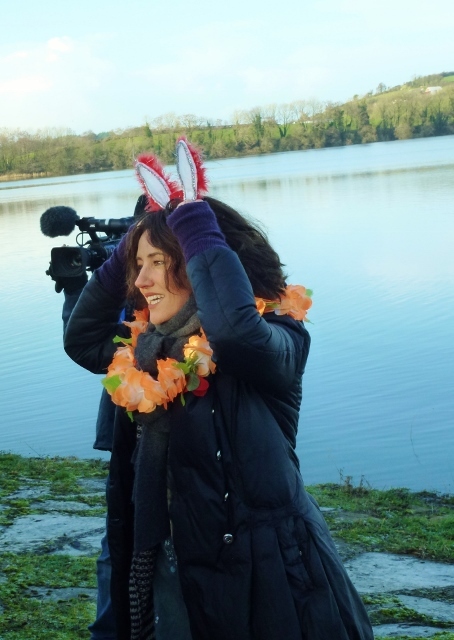 Among the supporters there this afternoon for the dip at 1pm was the actress Orla Brady who was staying at Castle Leslie. She is appearing in tonight’s special Christmas episode on BBC1 of Dr Who, in the role of Tasha Lem, a friend of the time traveller. Last year I came without any cash so this year I made sure I gave two donations and my daughter who was with me also contributed to this worthy cause. It was a pleasant half hour in very tranquil surroundings and a nice way to spend part of Christmas Day. For more details of the event see www.emyvale.net. Just to prove I was there: Cameraman Gregory Murphy got a new profile picture of me as I was being interviewed at the lakeside by Peadar McMahon. 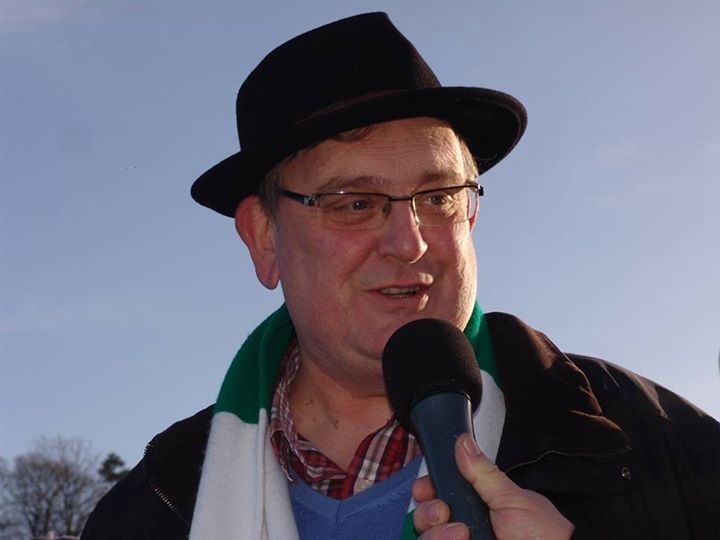 I had to admit to him it wasn’t as he suggested the Fermanagh colours draped around my neck, but possibly an Ireland emblem (for Tommy Bowe no doubt); then I revealed it was in fact my Shamrock Rovers FC scarf! 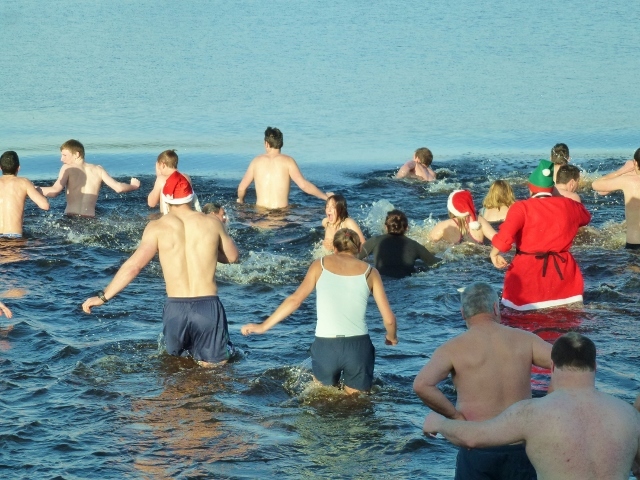 I added my congratulations to all those hardy people who had decided to take the plunge to support the great work of the Monaghan group, who included some Special Olympics athletes. Well done! 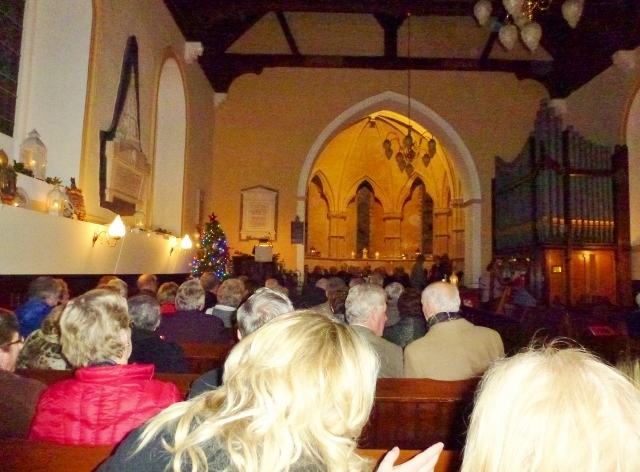 St Salvator’s Church of Ireland church beside Castle Leslie in Glaslough, County Monaghan, was the wonderful setting for ‘A Winter’s Tale’ performed on Monday night (23rd December) by Donagh Community Choir under the musical direction of Eithne McCord from Aughnacloy. The church built by Bishop John Leslie in 1763 and improved in 1890-96 became famous when it was the setting in June 2002 for the marriage (since dissolved) of the former Beatle Paul McCartney and Linda Mills. 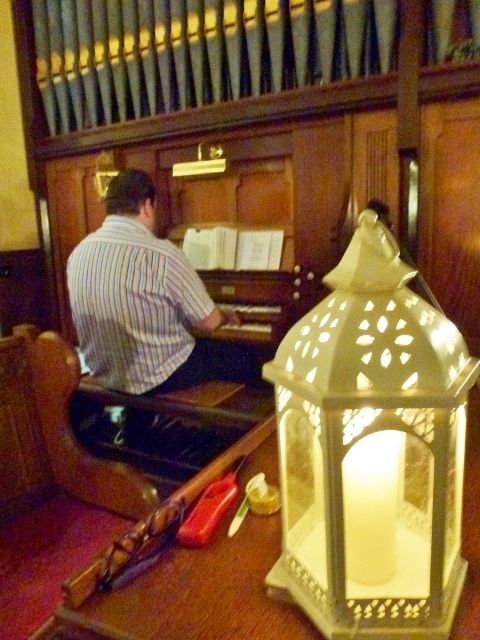 The organist was beautifully played by Glenn Moore, Director of Music at St Macartin’s Cathedral in Enniskillen. Glenn is a native of Kesh and has been playing the organ and leading the choir at Ardess Parish Church, his home parish, for over 18 years. He has played the organ for various services and has given recitals at numerous churches throughout the Diocese of Clogher and beyond. He has been organist for special services that have taken place in Clogher Cathedral. Whilst a pupil at Portora in Enniskillen he was taught the organ by former Cathedral Organist, Billy McBride. 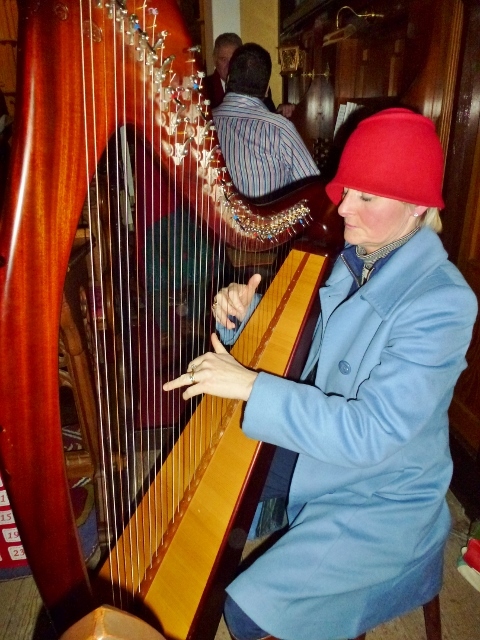 I was delighted to see that the harpist accompanying the organ so well for some of the songs was Liz McGuinness from Milltown, Monaghan who reminded me that she had organised arts events at the Castle many years ago, with David Norris among the guests. Liz was at the opening of the Garage theatre earlier this month. In September I met her at Connolly station in Dublin when she was one of the invited guests and interviewees during the RTÉ Big Music Week. We took the train to Newbridge and then Carlow, serenaded en route by the Bugle Babes who have been singing during the past week for Christmas shoppers at the Brown Thomas store in Grafton Street, Dublin. One of the guests at the service introduced by the Reverend Betty Thompson was the Precentor of St Macartan’s Cathedral in Clogher, Canon Noel Regan. 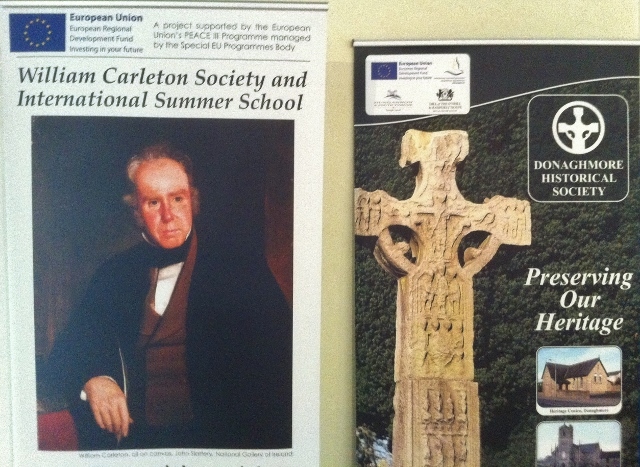 A native of Sligo, he has become a member and good supporter of the William Carleton Society and summer school. 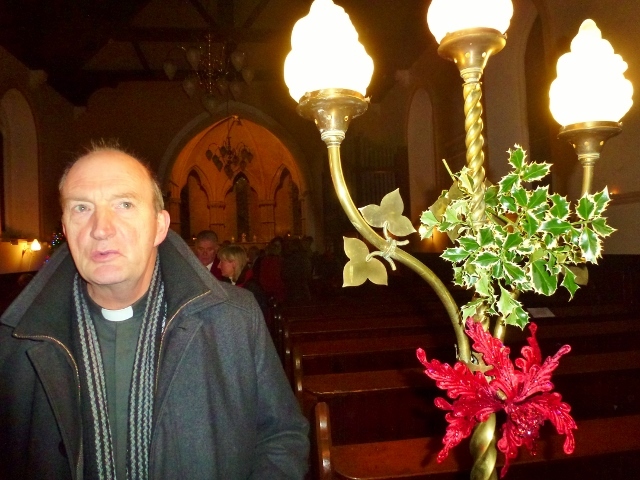 In October he preached at the harvest service at Errigal Truagh church, where Eithne McCord and the Donagh choir performed along with Blackwater Voice in a carol service three Sundays ago. Samantha Leslie read a Christmas poem ‘It started with a Baby’. 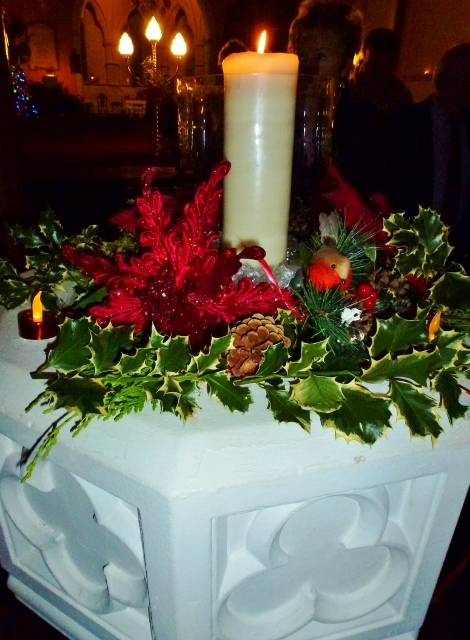 Afterwards she opened the Castle to guests who were treated to mulled wine and mince pies. The conservatory and surrounding area had been beautifully lit and the Christmas lights also looked well. Donagh Community Choir received a grant from the reconciliation fund of the Department of Foreign Affairs and Trade. I think the late Brian Earls, a Carletonian and a former diplomat who died in July, would have been very pleased to hear that. 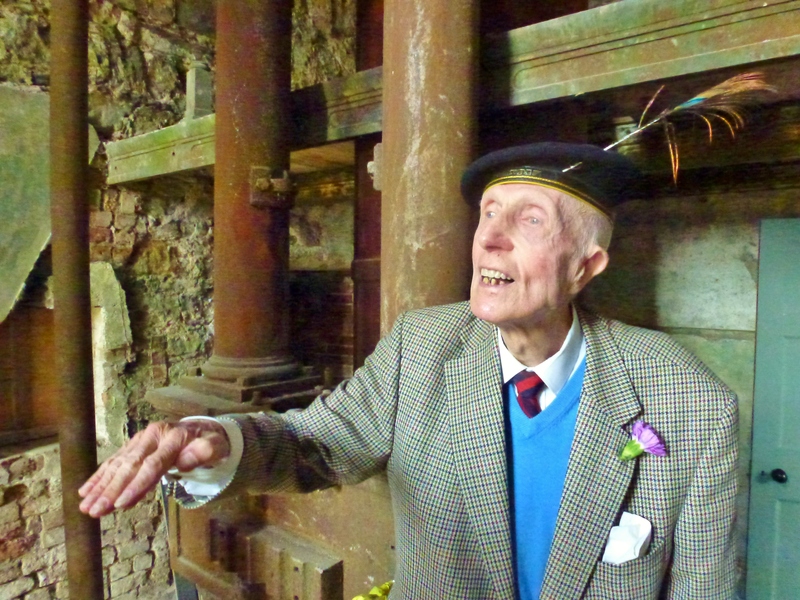 A few years ago after the William Carleton summer school I brought him to St Salvator’s church and Diane who happened to be there at the time kindly showed us inside. 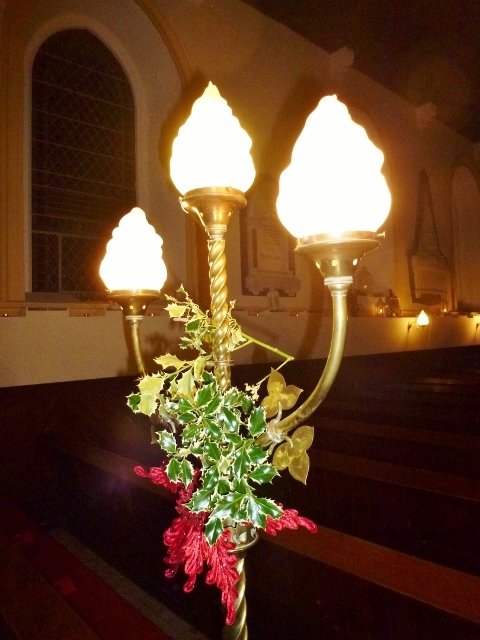 That was the only other occasion I have been in this church with which the Leslie family has been associated for 250 years. 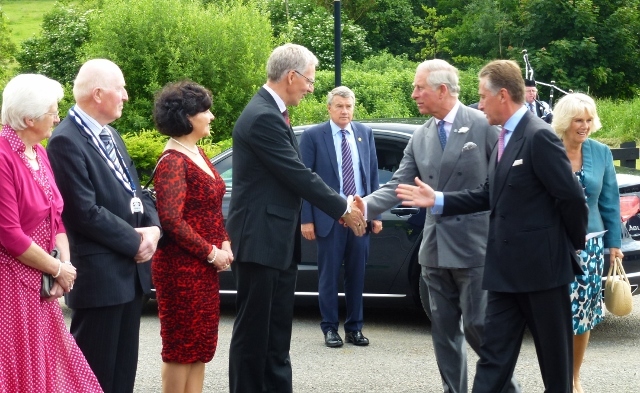 The border village of Caledon in County Tyrone was looking its best as it welcomed a royal visitor, His Royal Highness the Prince of Wales who is on a two-day visit to Northern Ireland along with Her Royal Highness the Duchess of Cornwall. It’s a while since any member of the British royal family came here, although the area is the seat of the 7th Earl of Caledon, Lord Lieutenant for County Armagh, which lies on the other side of the River Blackwater and where some of his 5000 acre estate is situated. It adjoins two other estates, Tynan Abbey (Armagh) and Castle Leslie across the border in Glaslough, County Monaghan. Sir Shane Leslie and his parents would have been in contact with their Caledon neighbours, as well as the Stronges. Sir John Leslie arrived to meet the royal visitors and remind them of his family’s connection with Winston Churchill. 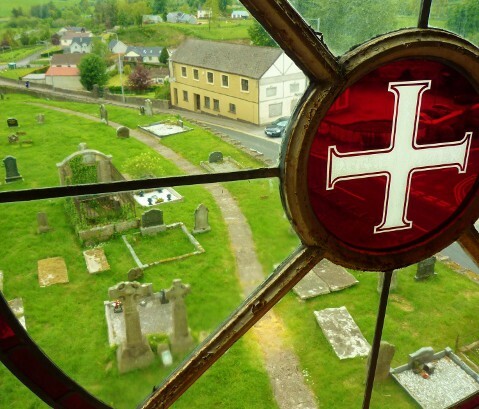 Tynan Abbey was destroyed in an IRA gun and bomb attack on January 21st 1981. The elderly Sir Norman Stronge (86), a former Stormont Speaker, Ulster Unionist politician and former British Army officer, was shot dead along with his only son James, a former Grenadier Guards officer and Unionist MP who was also an RUC Reservist. There are other reminders that this was one of the areas targeted by the IRA during the “troubles”. 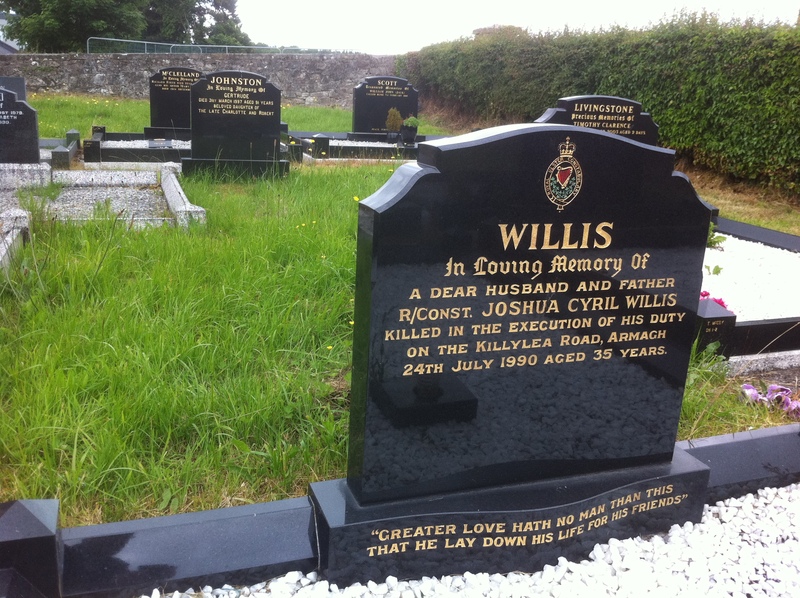 In the cemetery beside St John’s parish church, I came across the grave of an RUC Reservist Joshua Willis. The 35 year-old was killed when an IRA landmine containing at least 1000 lbs of explosives was detonated as his armoured patrol car passed along the Killylea Road outside Armagh. Two of his colleagues also died in the attack in July 1990. There was a fourth victim who was passing with a companion in another car, a Catholic nun, Sr Catherine Dunne of the St Louis sisters. She was based at Middletown. The IRA said the nun was the victim of ”unforeseen and fluke circumstances”. One of the nuns from Middletown was at a reception involving community groups who met the VIPs. 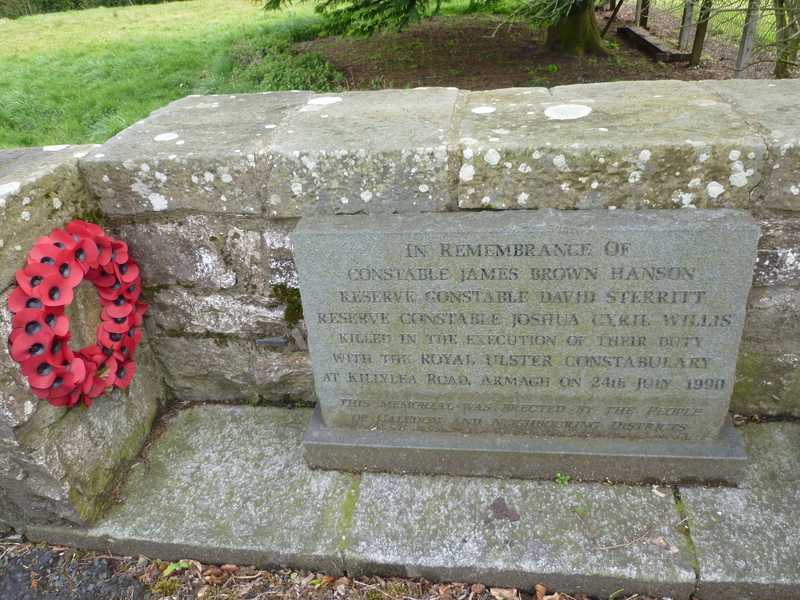 Not far away on the road towards Aughnacloy there is a memorial erected by local people in memory of the three policemen who were killed. It is close to the site of the former RUC/PSNI barracks, which has now been demolished. The site has now been sold for redevelopment. Prince Charles however was probably concentrating on other parts of this former mill village, where an extensive regeneration project has been carried out over the past few years, led by an enthusiastic committee. 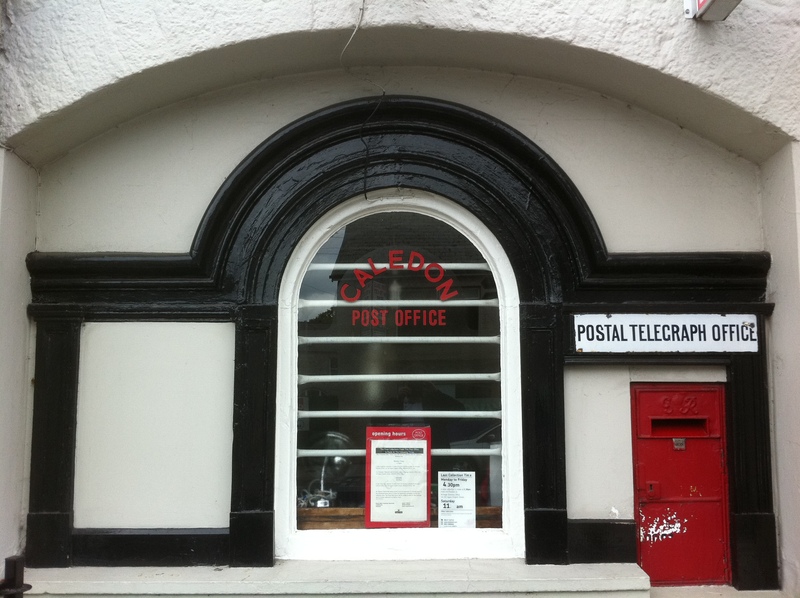 I wrote about the work of Caledon Regeneration project last April. 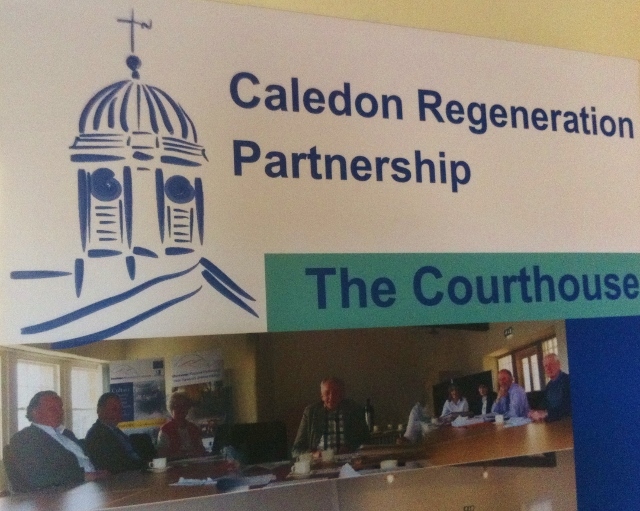 Caledon Regeneration Partnership was formed in 1994 to take forward a planned social, economic and environmental regeneration strategy for the County Armagh village. It is made up of representatives from the local community, local authority and Caledon Estates Company, which has an office in the main street. One of the projects being undertaken is the restoration of a beam engine and engine house. Last year a total of £220,000 in funding was secured to finance the first phase. It is hoped that the engine will eventually be restored to a fully operational state, and become a tourist attraction for the area. The unique piece of equipment dates back to the early 1830s and is one of the earliest surviving steam engines in Ireland. 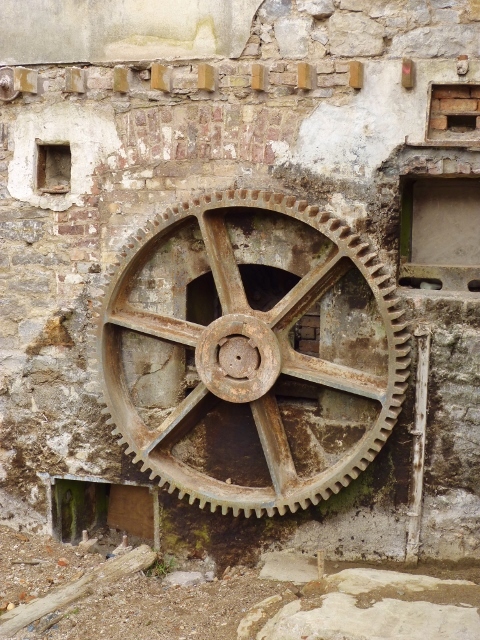 It was once used to power the Caledon Flour Mill and then Caledon Woollen Mills. In 1984 the village was designated as a Conservation Area and six years later, this was reviewed and the boundary extended. 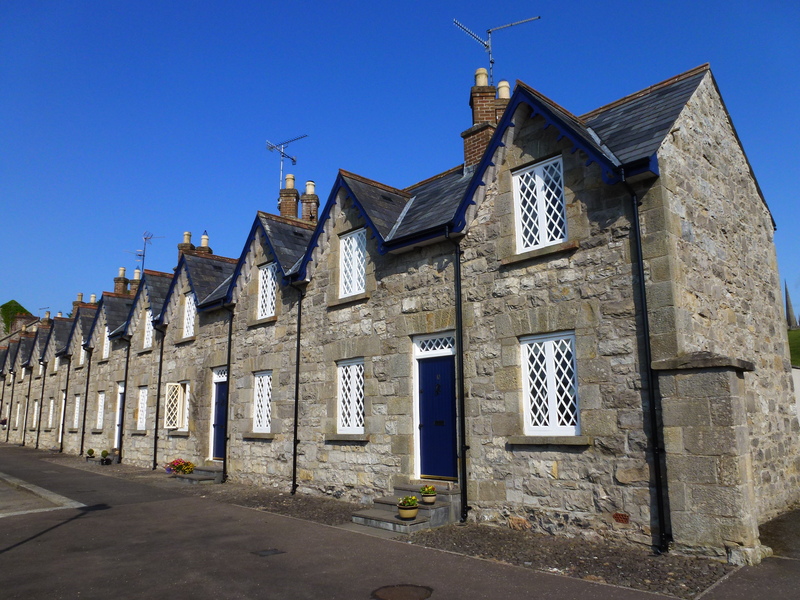 DoE (NI) Planning Service produced a Conservation Area Guide to accompany the original designation, which included design guidance intended to help protect the historic fabric of the village. In November 2001 a unique restoration scheme was officially opened by then Social Development Minister Nigel Dodds of the DUP. 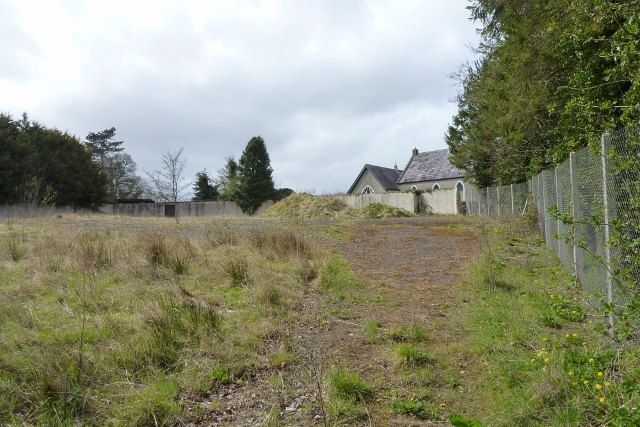 Caledon Regeneration is one of five groups taking part in the “Shared History, Shared Future” project under the Peace III programme run by Dungannon and South Tyrone Borough Council. 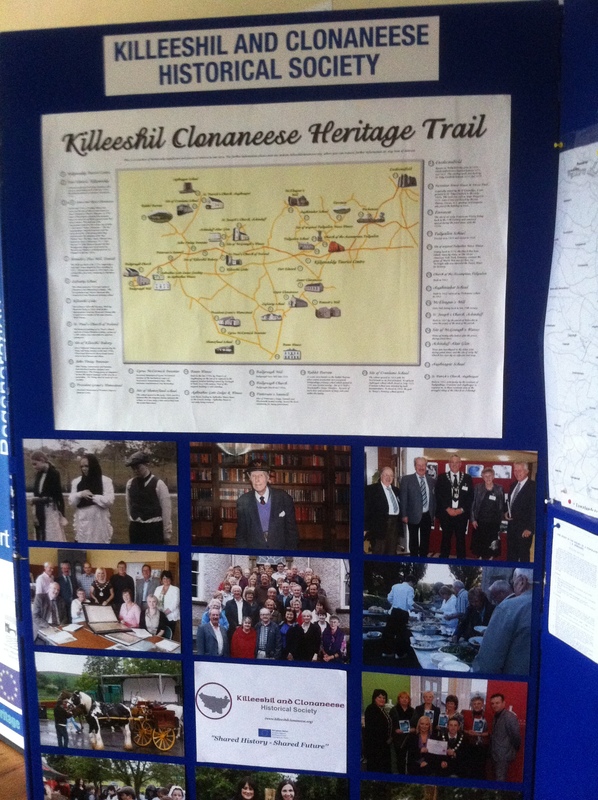 They had a display at the Courthouse along with the William Carleton Society, Killeeshil and Clonaneese Historical Society, Donaghmore Historical Society and South Lough Neagh Historical Society, which is working on a project about the Ulster Canal. 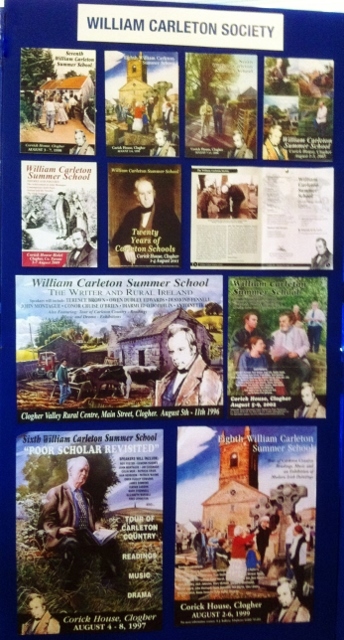 The historian Jack Johnston President of the William Carleton Society represented the group at the Caledon event along with Patron Sam Craig and Summer School Director Michael Fisher. On the second day of engagements (in Northern Ireland), TRH The Prince of Wales & The Duchess of Cornwall this morning visited the historical village of Caledon. They were accompanied by Lord Caledon and his wife, Lady Caledon. TRHs visited Mill Street Cottage and they met with the owners of one of the refurbished cottages, Denver and Michelle Irvine. This is one of the first projects to be completed by the regeneration scheme which had lain idle since the early 1970s. The terraced two-story stone cottage, which was constructed around 1850 to house mill workers and their families, received Grade B1 listing in 1983 and are now the pride of this lovely village. Prior to departing the Beam House, William Beattie invited HRH The Prince of Wales to unveil a plaque to officially open the complex. TRHs then made the short journey to the centrepiece of the village – the Court House and Clock Tower. On arrival at the Courthouse they had the opportunity to meet with children and teachers from St Joseph’s and Churchill Primary Schools, as well as representatives of the Blackwater Regional Partnership, South Tyrone Historical Group, local church leaders and members of the Women’s Institute. Prior to farewells, TRH The Prince of Wales and The Duchess of Cornwall were presented with a Food Hamper by two local school children.